An increasing number of businesses and organizations are preparing their departments and teams to take the leap to highly accessible cloud platforms that centralize projects, businesses processes and other business-related items. Therefore, many businesses make the switch to G Suite or Office 365 as their cloud-based solution and see one of these suites as a significant improvement. It’s both a logical and an effective strategy as businesses cooperate on a larger cross-border scale with more people involved in projects due to the fact that the internet is making it a lot easier to work together in one environment where location of the people involved isn’t a factor any longer. As the availability of such tools providing such features is expanding, businesses are logically weighing the advantages and disadvantages both G Suite and Office 365 software features. Apart from accessibility, ease of integration and functionality, privacy features is growing in weight when it comes to the decision-making process. It’s incredibly important for businesses that vital company data is well-protected, especially considering the rise of cyber security threats. In this article, I’ll take a deep dive into the privacy features of G Suite and Office 365 and compare both suites in order to determine which offers the best privacy features. In the first section, let’s take a look at the data centers of both cloud providers and how your privacy and security is guarded from there. After that, we’ll take a deeper dive into other privacy-related features both platforms offer. 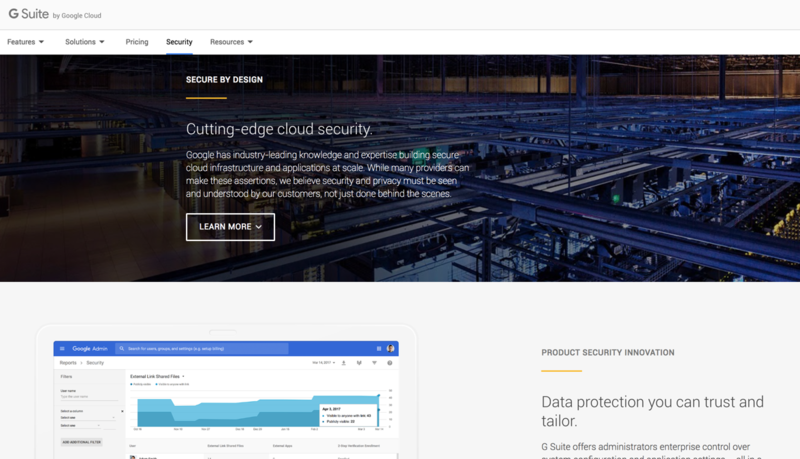 The physical security at Google’s data centers is top-notch and includes 24/7 guards, highly restricted electronic access cards and metal detectors. Data center employees have to go through a double verification process which consists of a biometric eye-scan and full body scan. Also, Google controls the hardware stacks in-house, this enables the ability to respond fast to any potential threats. The servers are all interlinked, which means that if one of the servers fails, your data is still available through other servers. Microsoft’s data centers are also 24/7 guarded facilities with multi-factor authentication stages. Similar to Google, Microsoft uses biometric scanning procedures to grant access to data center employees. The internal network isn’t connected to an external network which means that it’s nearly impossible to infiltrate the internal network. Also, Microsoft implemented a process called “lockbox processes” which is a highly supervised process that deals with threats but requires very little access of employees to data. 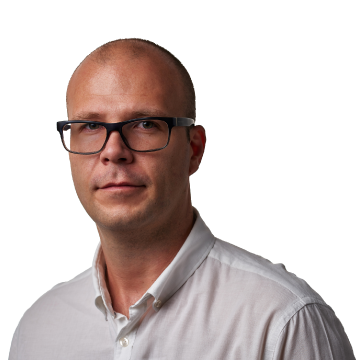 All the data that runs through the servers is based on whitelisted scripts, thus it’s highly unlikely that malicious code slips through the defense systems. When your data is in transit between Google’s servers or to another server, it’s fully encrypted as it moves. Thus, even if data is intercepted in transit, it’s unreadable and can only be decrypted with a forwarded decryption key. This type of encryption also applies to every single email sent and received. Regardless what app of G Suite you’re using, any data is moving through a secure HTTPS tunnel. In addition, Google increased the length of their RSA encryption key to 2048 bits, which makes it incredibly hard to decrypt with using cryptanalytic. Every single Office 365 product’s data is stored in a fully encrypted environment, as well as in transit with SSL/TLS encryption. In addition, Office 365 Advanced Threat Protection offers incredibly advanced security features against spam, malware and other types of online threats that could infiltrate your email. Microsoft’s servers provide file-and volume encryption through IPsec and TLS. On top of that, a two-factor authentication process is in place to to add another layer of extra security. Office 365 encryption methods are constantly being reviewed by third party cryptography experts. Google is without a doubt working tirelessly on updating and improving the security and privacy features of G Suite and other apps, but there are still some areas that are not fully covered as of yet when it comes to sensitive patient data protection. At the time of writing, Google Groups, Google Contacts and Google+ are not HIPAA compliant. You can read more about G Suite privacy certifications on the business data information page. More information on GDPR compliance can be found here. 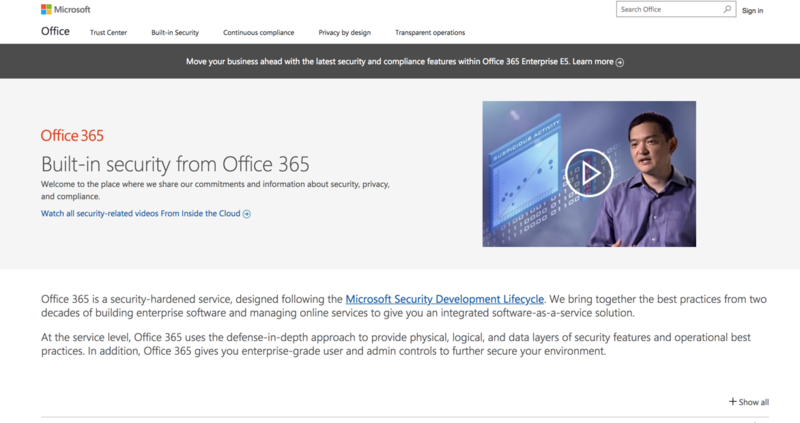 Office 365 has been extremely dedicated to optimize security and privacy features in all of their products over the years. This is partly better aligned to their business model since Office 365 doesn’t rely on revenue based on advertisement, which is Google’s main source of revenue. The long list of compliance certifications and other white papers is at the core of every Office 365 feature. So, in contrast to G Suite, you don’t have to wonder which apps are compliant and which apps within Office 365 aren’t. You can read more about Office 365 privacy certifications on the information page. More information on GDPR compliance can be found here. Both G Suite and Office 365 are the crème de la crème of the cloud-based service providers and - technically speaking - are pretty even. Both companies integrated privacy features in the core of their respective products, which leaves users the option to choose a platform based on their personal preferences and what suits them best. Bill Hess always assumed big technology companies strongly protected their customer's digital privacy. After an incident where his credit card details were stolen, email hacked and accounts at secure websites compromised, he realised that security and privacy on the web should not be taken for granted. Bill created Pixel Privacy to share his knowledge and help everyone protect themselves online. Pixel Privacy is a site dedicated to making the world of online privacy easy no matter how tech literate you are. We all have the power to make sure our private data doesn’t fall into the wrong hands, and our site is here to show you how!